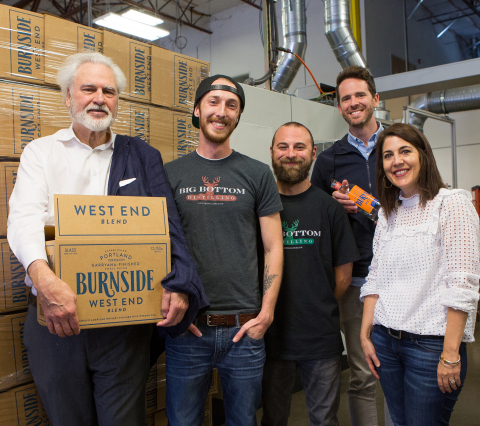 PORTLAND, Ore.--(BUSINESS WIRE)--Eastside Distilling, Inc. (NASDAQ: ESDI) (“Eastside” or the “Company”), a producer of award-winning craft spirits, today announced first deliveries of West End Blend, an American whiskey that is finished in Oregon Oak. West End is crafted from whiskeys that age for up to five years in traditional American white oak before being transferred to barrels of Oregon Oak. Oregon Oak finishing, prized for the complexity it adds to bourbon and whiskey, is gaining popularity inside and outside Oregon. The vibrant new look of the West End bottle is the product of a nine month “all Portland” creative collaboration with local spirits branding powerhouse, Sandstrom Partners ("Sandstrom"), and is meant to reflect West End’s uniqueness and its roots in Portland, Oregon. The West End blended whisky is scheduled to be followed shortly by two bourbon products and later this season by a rye whiskey. 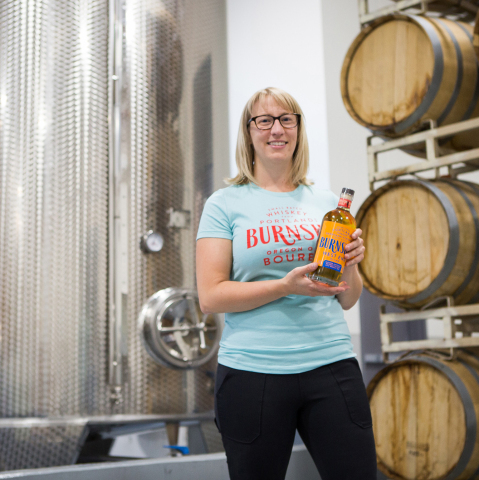 All members of the Burnside family of bourbons and whiskeys share the common characteristic of being finished by resting in casks made by hand from Oregon Oak, thereby making the product line unique among spirits offerings. The Company released the first bourbon finished in Oregon Oak in 2012. After its success in winning many gold medals in competition, the Company decided to fully embrace the technique that it had pioneered, and chose to finish all of its spirits using the method. Sandstrom’s branding unbundles Burnside Bourbon from the image of Major General Ambrose Burnside that was previously on the bottles and realigns it with Burnside Street, the Portland street artery that divides Portland’s North and South. Burnside Street is now a thriving hub of activity that's alive with creative expression, art galleries, Powell’s Books, iconic record stores and music venues that makes it the epicenter for one of Portland’s most celebrated music scenes. Sandstrom also wanted the Burnside Bridge to play a role in the redesign because of its civic significance and took design cues from it. If Burnside is the heart of Portland, then the bridge is the heart of Burnside. 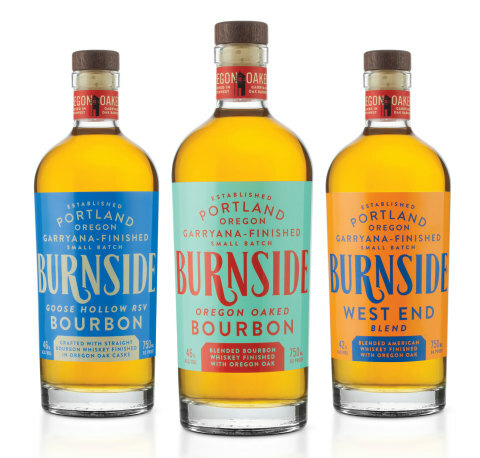 Burnside Bourbon's new design, with its bold typography and unexpected color relationships, draws its inspiration from the music posters that graced any number of telephone poles along the busy street. In December of 2016, Eastside entered into a strategic partnership with Sandstrom for spirits branding that extends to its Eastside's entire IP of existing and contemplated products. Sandstrom is a significant shareholder of Eastside and is represented on Eastside's Board of Directors. The current release of the Burnside brand is the first of what Eastside anticipates will be many brand innovations in collaboration with Sandstrom. Founded in Portland, Oregon in 1990, Sandstrom Partners is a brand development company that focuses on the creation and revitalization of thought leading brands. Thought leading brands defined as brands that desire to appeal to new audiences, change the category paradigm and capitalize on emerging trends. Some of Sandstrom Partners current and past clients/brands include Tazo Tea, Bacardi Oakheart, Sonoma Cider, Castor & Pollux, Stillhouse Distilling, Miller Brewing, Converse, Brown Forman/Chambord and Old Forester, Diageo/Bulleit Bourbon, Virgin Mobile, Levi Strauss, Target, ESPN, Nike, Reebok, Adidas, Smith Tea, Coca-Cola, Pernod Ricard, Full Sail, Session Lager, St-Germain, Brown-Forman, Sokol Blosser, Hansen's Soda and Aviation Gin.